The Tech Works CI-HSI-41 Headset Combiner is part of the Collaborative Intercom product group designed to take standard Plantronics headsets and let them talk to each other as well as other Tech works CI-Buss products. The CI-HSI-41 accommodates up to four Plantronics CS-540 lightweight, Wireless Headsets. The headsets communicate with each other, as a single headset with four summed microphones. The Intercom can simply plug together using standard CAT-6 patch cables. When connected to another unit all headsets become part of that system. 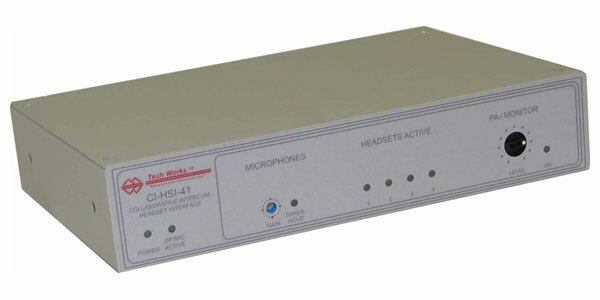 Two CI-HSI-41s can be connected together to make a single system of up to 8 headsets. The eight headsets act as one unit. Initial setup is accomplished with built in level indicator lights and the controls on the receiver/charging base. Once completed, no further adjustments should be required. The CI-HSI-41 can be used as a small stand- alone Wireless Headset Intercom or as an addition to systems using microphones, speakers, and other CI-Buss and P A-Buss devices. By adding a PA-402 the headset conversation can be played over ceiling speakers so observers can hear the conversation. When combined with our full duplex, hands-free intercom and other products the CI-HSI-41 provides a level of flexibility and control unmatched in communication.